GM says mid-sized Chevrolet pickup to keep Colorado name in U.S. The revamped pickups follow 18 new or refreshed vehicles the biggest U.S. automaker is bringing out this year in its home market. TRAVERSE CITY, Mich. (Bloomberg) -- General Motors Co. said its mid-sized pickups will keep the Chevrolet Colorado and GMC Canyon names when redesigned models reach showrooms next year, after the automaker considered a change. Chief Financial Officer Dan Ammann showed a glimpse of the new trucks today during a presentation at the 2013 CAR Management Briefing Seminars here. "This is a segment that used to be a very big portion of the overall truck market," Ammann told reporters before his presentation. "It's diminished over the years partly because, in our view, there hasn't been the kind of offering in the segment that customers were really looking for." The revamped pickups follow 18 new or refreshed vehicles the biggest U.S. automaker is bringing out this year in its home market. The trucks continue an effort to remake GM's lineup as among the newest in the industry from one of the oldest. "The Colorado will be positioned as a sport truck," Ammann said. 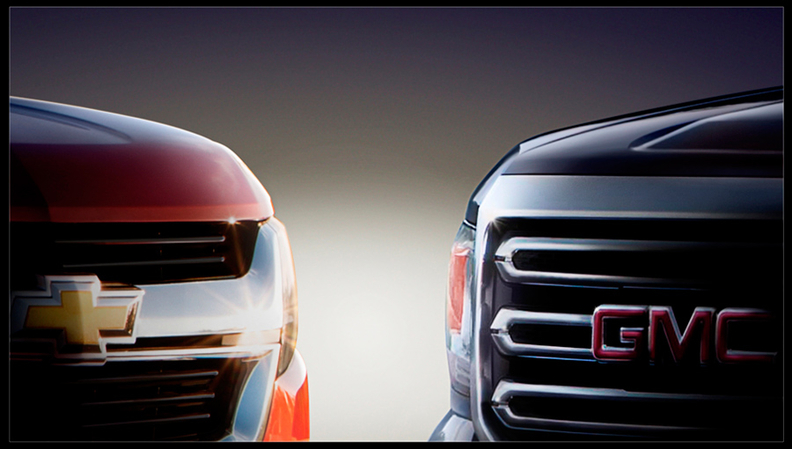 "The Canyon will live squarely up to GMC brand promise of professional grade." GM North America President Mark Reuss told reporters in April that the automaker was considering new names for the Colorado and Canyon. The company decided against a change because of their brand equity, Ammann said today. Meanwhile, Ammann said GM has no current plans to pay a dividend on its common shares, a move that many investors have longed for. "We're not paying a dividend at this point," he said. "It's something we expect down the road." He gave no time frame. CEO Dan Akerson said in June that GM would consider a dividend and further share buybacks going forward. He cited GM's December repurchase of a block of U.S. Treasury shares for $5.5 billion and said GM might take a similar approach again. GM last paid a dividend on common shares in May 2008 and two months later said it would suspend such payments. Weak industry demand then drove the company to seek bankruptcy protection in 2009 and it emerged as a leaner operation with more cash on hand with the help of a $49.5 billion U.S. taxpayer bailout. GM does pay a dividend on preferred stock. Rival U.S. automaker Ford Motor Co. resumed paying a common dividend in March 2012 after suspending it for more than 5-1/2 years. GM ended the second quarter with almost $35 billion in total automotive liquidity, and analysts said it could begin paying a dividend to common shareholders again once the U.S. government has exited its stake, which it has said will happen by April 2014. Treasury still owns a stake in GM of about 13.8 percent. Ammann also said the decline in the value of the Japanese yen has created competitive challenges for GM in such markets as Southeast Asia and Australia. "We're seeing more pressure in those markets than in the U.S.," he said. In the second quarter, GM's international operations unit, which includes Asia, took a $100 million hit to profit due to lower pricing on vehicles.